Resembling a whale out of water, here you see the Dymaxion, a three-wheeled vehicle being manufactured at Bridgeport, Conn., as “the car of the future.” The invention of Buckminster Fuller, the super-streamlined model has two front wheels set midway in the ovaloid body and one rear wheel, set in the tail, which does the steering, rudder fashion. It uses little gasoline, but can travel 125 miles an hour. 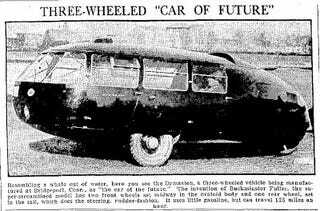 The May 6, 1934 News and Tribune (Jefferson City, MO) ran the photograph above of Buckminster Fuller’s Dymaxion “Car of the Future.” The advertisement below, which ran in the April 23, 1934 New Castle News (New Castle, PA) used an image of the streamlined Dymaxion to help sell motor fuel.